H. pylori are the only bacteria known to survive in the human stomach. Infection with H. pylori is associated with an increased risk of gastric cancer, the second-leading cause of cancer-related deaths worldwide. "More than half the world's population is currently infected with H. pylori," said University of Illinois microbiology professor Steven Blanke, who led the study. "And we've known for a long time that the host doesn't respond appropriately to clear the infection from the stomach, allowing the bacterium to persist as a risk factor for cancer." 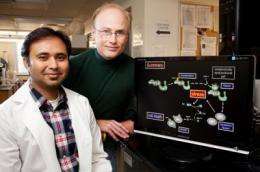 The new study, in Proceedings of the National Academy of Sciences, is the first to show how a bacterial toxin can disrupt a cell's mitochondria  its energy-generation and distribution system  to disable the cell and spur apoptosis (programmed cell death). "One of the hallmarks of long-term infection with H. pylori is an increase in apoptotic cells," Blanke said. "This may contribute to the development of cancer in several ways." Apoptosis can damage the epithelial cells that line the stomach, he said, "and chronic damage to any tissue is a risk factor for cancer." An increase in apoptotic cells may also spur the hyper-proliferation of stem cells in an attempt to repair the damaged tissue, increasing the chance of mutations that can lead to cancer. Previous studies had shown that VacA, a protein toxin produced by H. pylori, induces host cell death, Blanke said, "but the mechanism had been unknown." The VacA protein was known to target the mitochondrion, an organelle that produces chemical energy where it is needed in the cell. In healthy cells, mitochondria fuse to form elaborate energy-generating networks in response to cellular needs. Mitochondria are important to a lot of other cellular processes; most important to Blanke and his colleagues, they regulate cell death. While studying how a cell responds to infection, the researchers noticed that H. pylori induced mitochondrial fission. Instead of fusing and forming filamentous networks to respond to the cell's energy needs, the mitochondria were breaking into smaller, unconnected organelles. "Fusion and fission are two dynamic and opposing processes that must be balanced to regulate mitochondrial structure and function," Blanke said. But infection with H. pylori  or with purified VacA toxin alone  was pushing the mitochondria toward fission. The researchers found that VacA recruited a host protein, Drp1, to the mitochondria. This protein plays a central role in mitochondrial fission. Further experiments showed that Drp1-mediated fission of the mitochondrial networks was linked to activation of a cell-death-inducing factor, called Bax. "The link between VacA action at the mitochondria and Bax-dependent cell death had previously been unknown," Blanke said. This study provides a first direct link between a bacterial toxin-mediated disruption of mitochondrial dynamics and host cell death, Blanke said. It also opens a new avenue of investigation of other diseases linked to impaired mitochondrial function, he said. "Hundreds of human diseases and disorders are associated with mitochondrial dysfunction, ranging from cancers to degenerative diseases such as Alzheimer's disease and Parkinson's," Blanke said. "As yet, no one has methodically investigated a potential link between bacterial infections and mitochondrial diseases, despite the fact that several dozen pathogenic bacteria and viruses are known to directly target mitochondria." Blanke and his colleagues are beginning to investigate that link. "To us, finding that a pathogen can disrupt mitochondria in a manner that has striking similarities to what has been observed in known mitochondrial diseases is potentially very exciting," said Blanke, who also is an affiliate of the Institute for Genomic Biology at Illinois. Isn't that jumping the gun? There is quite some difference between "associated with an increased risk of gastric cancer" and a "cancer-causing bacterium". I see a new "anti-cancer vaccine" on the horizon, developed along the lines of the controversial HPV vaccine. (There is no proof of a *causal* relation between HPV and cervical cancer.